Real GDP grew at a seasonally adjusted annual rate of 2.6% during the fourth quarter of 2017, according to the Bureau of Economic Analysis’s “advance” estimate, down from 3.2% in the third quarter. 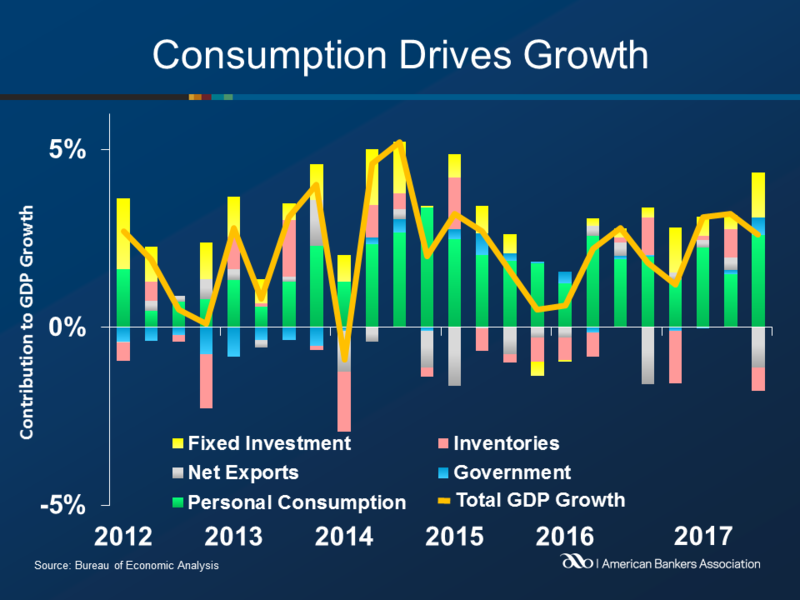 The growth in real GDP reflected positive contributions from personal consumption expenditures, nonresidential fixed investment, exports, residential fixed investment, state and local government spending, and federal government spending. These were partly offset by negative contributions from private inventory investment and imports. Consumption accounted for 2.6% of the gain, up from 1.5% during the third quarter. Fixed investments accelerated, adding a total of 1.3% to GDP. After inventories contributed 0.8% to GDP last quarter, they subtracted 0.7% in the fourth quarter. Government spending picked up during the quarter, adding 0.5% to growth. Federal government contributed 0.2% to the GDP increase, while state and local spending added 0.3%. Net exports were the largest drag to growth, subtracting 1.1% to GDP.